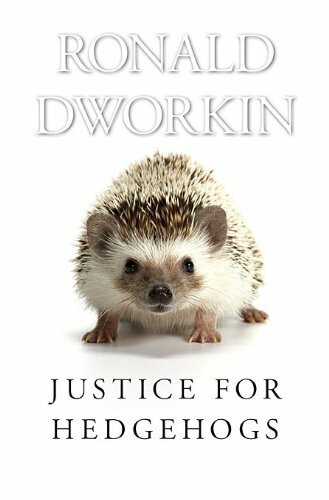 Political Theory - Habermas and Rawls: New book by Dworkin: "Justice for Hedgehogs"
New book by Dworkin: "Justice for Hedgehogs"
Skepticism in all its forms — philosophical, cynical, or post-modern — threatens that unity. The Galilean revolution once made the theological world of value safe for science. But the new republic gradually became a new empire: the modern philosophers inflated the methods of physics into a totalitarian theory of everything. They invaded and occupied all the honorifics — reality, truth, fact, ground, meaning, knowledge, and being — and dictated the terms on which other bodies of thought might aspire to them, and skepticism has been the inevitable result. We need a new revolution. We must make the world of science safe for value. Boston University Law Review (vol. 90 no. 2, April 2010) brings a number of papers on Dworkin's book, including papers by Thomas Scanlon, Amartya Sen, Kwame Anthony Appiah, Frank I. Michelman, and Jeremy Waldron and a response from Ronald Dworkin. The papers are from a symposium on "Justice for Hedgehogs", September 25-26, 2009, at Boston University School of Law. Videos from the symposium can be found here! Various drafts have circulated. Excerpts are available here & here. Ronald Dworkin is Professor of Philosophy at New York University. An excerpt from Chapter 9 on ethics (pp. 191-199) has been published in "The New York Review of Books" (February 10, 2011), entitled "What Is a Good Life? ".